"Minot" redirects here. For other uses, see Minot (disambiguation). Minot (/ˈmaɪnɒt/ ( listen) MY-not) is a city in and the county seat of Ward County, North Dakota, United States, in the state's north-central region. It is most widely known for the Air Force base located approximately 15 miles (24 km) north of the city. With a population of 40,888 at the 2010 census, Minot is the fourth largest city in the state and a trading center for a large portion of northern North Dakota, southwestern Manitoba, and southeastern Saskatchewan. Founded in 1886 during the construction of Jim Hill's Great Northern Railway, Minot is also known as "Magic City", commemorating its remarkable growth in size over a short time. "The Magic City"; "Little Chicago"
US 2, US 2 Bus., US 52, US 52 Bus., US 83, US 83 Byp. Minot is the principal city of the Minot micropolitan area, a micropolitan area that covers McHenry, Renville, and Ward counties and had a combined population of 69,540 at the 2010 census. In 2017, it was estimated that the population of the Minot Micropolitan Area was 77,309. Dakota Territory circa 1886, showing Burlington, at the time the county seat, and Minot, which was a smaller, unincorporated village. Minot came into existence in 1886, after the railroad laid track through the area. A tent town sprang up overnight, as if by "magic", thus the city came to be known as the Magic City, and in the next five months, the population increased to over 5,000 residents, further adding to the nickname's validity. The town site was chosen by the railroad to be placed on the land of then-homesteader Erik Ramstad. Ramstad was convinced to relinquish his claim, and became one of the city leaders. The town was named after Henry D. Minot, a railroad investor, an ornithologist and friend of Hill. Its Arikara name is niwaharít sahaáhkat; its Hidatsa name is dibiarugareesh, ("Plum Coulee"). The city was incorporated on July 16, 1887. The Minneapolis, St. Paul and Sault Ste. Marie Railroad (Soo Line) later built a line from Valley City up to Canada. While initially their plan was to cross the Mouse River at Burlington, local interests and arguments convinced them otherwise; landholders along the new route donated the right-of-way. They reached Minot in 1893. A July 22, 1920 tornado passed over Minot and bore down in a coulee three miles southeast of town. The tornado picked up the Andy Botz home and hurled it to the ground, killing Mrs. Botz, breaking Mr. Botz's shoulder, and slightly injuring the two Botz children who were in the house. Minot and its surrounding area were wide open throughout 1905-20. Population grew rapidly due to railroad construction and availability of unclaimed land. Nearly complete court records of Ward County and Minot document the prevalence and different types of criminal activity, and offer strong support for the dubious title of "crime capitol of North Dakota." State attorney general William Langer helped clean up the town in 1917-1920, but by the time Prohibition had arrived in the 1920s the city had become a center of illegal activities associated with the High Third district, which were exacerbated due to the city being a supply hub of Al Capone's liquor smuggling operations. The hotbed of alcohol bootlegging, prostitution, and opium dens that sprang up in the Downtown area soon led people to give Minot the nickname "Little Chicago." The Smugglers used a network of underground tunnels (some of which were previously built for heating or deliveries) to transport and conceal the illicit cargo entering from Canada. The 1950s saw a large influx of federal funding into the region, with the construction of Minot Air Force Base (1956–57) thirteen miles (21 km) north of the city, and Garrison Dam (1947–53) on the Missouri River, about fifty miles (80 km) south of Minot. In 1969, a severe flood on the Mouse River devastated the city. Afterward, the Army Corps of Engineers straightened the path of the river through the city and built several flood control structures. The Old Soo Depot Transportation Museum is housed in the historic Soo Line depot (built 1912) in downtown Minot. On January 18, 2002, a severe train derailment west of the city sent a gigantic cloud of anhydrous ammonia toward Minot, and Burlington. One man died and many of Minot's citizens were sickened and severely injured by the noxious gas, causing one of the worst major chemical accidents of the country. In early 2006, court cases were heard in Minneapolis, Minnesota, against Canadian Pacific Railway, the owner of the derailed train. The anhydrous ammonia spill was the largest such spill in U.S. history. This incident was used by Eric Klinenberg in his book Fighting for Air: The Battle to Control America's Media as an example of the failure of mass-media, specifically local radio stations, to disseminate information to the public in an emergency. The 2011 Mouse River flood caused extensive damage throughout the Mouse River Valley. On June 21, 2011, KXMC-TV reported that a flood of historic proportions was imminent in the Mouse River Valley, largely due to large dam releases upstream. Around 12,000 people were evacuated. On June 26, flooding exceeded previous records when the river crested at 1,561.72 feet above sea level, three feet above the previous record set back in 1881. It is estimated that 20 percent of Minot sustained damage from the flood. This figure includes over 4,100 homes which were someway affected, 2,376 extensively damaged, and 805 damaged beyond repair. Burlington was also severely damaged during this time. According to the United States Census Bureau, the city has a total area of 17.45 square miles (45.20 km2), of which 17.43 square miles (45.14 km2) is land and 0.02 square miles (0.05 km2) is water. Minot is commonly divided into three major divisions. These divisions are North Hill, the Mouse River Valley and South Hill. North Hill is the area roughly north of Eleventh Avenue North and Northwest Avenue. South Hill is a broad area south and west of Valley Street and Fifth Avenue South. West of Sixth Street West, South Hill dips sharply to the southwest. The limits of South Hill are less clearly defined than North Hill. Though the neighborhood levels out past Sixteenth Street South, the name South Hill is generally applied to all areas south up to the city limits. Neighborhoods in the Mouse River Valley include Bel Air, Downtown, Eastwood Park, Oak Park and West Minot. Minot is located on the Drift Prairie of northwestern North Dakota. Minot is at 48°13′59″N 101°17′32″W﻿ / ﻿48.23306°N 101.29222°W﻿ / 48.23306; -101.29222, about 100 miles (160 km) north of Bismarck. The Mouse River, or Souris River, runs through the city west to east. Important cities in the region for which Minot is the trading center include Burlington, Velva, Garrison, Stanley, Bottineau, Rugby, and New Town. Minot is almost entirely land; the Mouse River, its oxbow lakes, and a few creeks take up just 0.14% of the city's total area. The elevation of the river at the city center is 1,540 feet (470 m) above sea level. [not in citation given] The valley sits some 160 feet (49 m) below the surrounding plains; the elevation at the Minot International Airport on "North Hill" is 1,716 feet (523 m). The city has several small horseshoe-shaped oxbow lakes within its limits near the river, created due to the Mouse's meandering course. The city is laid out on a grid-based street system. Streets run north-south and avenues run east-west. Streets are numbered by their block distance east or west of Main Street. Similarly, Avenues are numbered north and south of Central Avenue. There are four city quadrants (NW, SW, SE, NE) to describe the exact location of any given address. Main Street addresses are simply designated North and South. Central Avenue addresses are simply designated East and West. The grid addressing system carries over into the rural areas of Ward County, making the county one of only three that do not follow the statewide grid system in North Dakota (the others being Burleigh County and Grand Forks County). The Mouse River divides the city approximately in half, north and south. The valley rises to the plains both north and south of the river. Although there are names for certain features of these hills, such as Anthony Hill on South Hill, there are no general names for these topographical features. The northern rise and the plateau north of it are referred to as North Hill and the southern rise and plateau south of it are referred to as South Hill. Minot experiences a humid continental climate with warm summer (Köppen: Dfb) in its marginal zone receiving sufficient precipitation for such category, being that during the year it exhibits great temperature variations as in Central Asia. Summers range from warm to moderately hot, with frequent thunderstorm activity. Winters are typically bitterly cold and snowy, with high winds and below-freezing temperatures for weeks at a time. Lows below 0 °F (−18 °C) occur on about 39 days during the winter, while temperatures reach 90 °F (32 °C) on 14 days per summer, and in some years reach 100 °F (38 °C). The average annual snowfall total is 43 inches (110 cm). As of the census of 2010, there were 40,888 people, 17,863 households, and 9,978 families residing in the city. The population density was 2,345.8 inhabitants per square mile (905.7/km2). There were 18,744 housing units at an average density of 1,075.4 per square mile (415.2/km2). The racial makeup of the city was 90.2% White, 2.3% African American, 3.2% Native American, 0.9% Asian, 0.1% Pacific Islander, 0.6% from other races, and 2.7% from two or more races. Hispanic or Latino of any race were 2.7% of the population. There were 17,863 households of which 26.3% had children under the age of 18 living with them, 42.1% were married couples living together, 9.6% had a female householder with no husband present, 4.1% had a male householder with no wife present, and 44.1% were non-families. 34.9% of all households were made up of individuals and 11.7% had someone living alone who was 65 years of age or older. The average household size was 2.20 and the average family size was 2.86. The median age in the city was 33.8 years. 21.1% of residents were under the age of 18; 14% were between the ages of 18 and 24; 26.7% were from 25 to 44; 23.2% were from 45 to 64; and 15% were 65 years of age or older. The gender makeup of the city was 49.3% male and 50.7% female. As of the census of 2000, there were 36,567 people, 15,520 households, and 9,265 families residing in the city. The population density was 2,513.1 per square mile (970.4/km²). There were 16,475 housing units at an average density of 1,132.3 per square mile (437.2/km²). The racial makeup of the city was 93.18% White, 1.34% African American, 2.76% Native American, 0.62% Asian, 0.07% Pacific Islander, 0.49% from other races, and 1.54% from two or more races. Hispanic or Latino of any race were 1.47% of the population. The most populous ancestry groups in the city are German (40.8%), Norwegian (32.3%), Irish (8.7%), English (5.4%), Swedish (4.2%) and French (3.2%). There were 15,520 households, of which 28.6% had children under the age of 18 living with them, 46.6% were married couples living together, 10.0% had a female householder with no husband present, and 40.3% were non-families. 32.5% of all households were made up of individuals and 12.0% had someone living alone who was 65 years of age or older. The average household size was 2.27 and the average family size was 2.90. In the city the population was spread out with 23.2% under the age of 18, 13.3% from 18 to 24, 27.4% from 25 to 44, 20.7% from 45 to 64, and 15.4% who were 65 years of age or older. The median age was 35 years. For every 100 females, there were 93.1 males. For every 100 females age 18 and over, there were 89.0 males. As of 2000 the median income for a household was $32,218, and the median income for a family was $42,804. Males had a median income of $30,283 versus $20,023 for females. The per capita income for the city was $18,011. About 8.8% of families and 12.8% of the population were below the poverty line, including 16.0% of those under age 18 and 8.9% of those age 65 or over. The mayor of Minot is Shaun Sipma. As mayor he chairs the 7-member City Council, but only casts a vote to break a tie. The day-to-day affairs of the city are handled by the City Manager, currently Tom Barry. Minot uses the Council-manager system of government. Seven councilmen are elected from 7 city wards to four-year terms. Elections are arranged such that one councilman from each ward is elected in every even-numbered year. The mayor of Minot is elected to a four-year term as well; the last mayoral election was in 2014. All city offices are nonpartisan. City elections are held in June in North Dakota, along with the state primary election. While the city's leadership has been trending towards the conservative, Minot's liberal factions have been active in recent years and have had somewhat more success than in other areas of the state. The Northwest Area Water Supply (NAWS) has had disputes with the Canadian government over a plan calling for water to be pumped from Lake Sakakawea, then to Minot for treatment, and then on to large stretches of Northwest North Dakota. Minot voters decided in 1998 to levy a 1% sales tax to go towards the construction of NAWS; this tax fund was found in court to have been illegally diverted towards economic development purposes. A lawsuit was filed against the city and it was ordered to return the misappropriated funds to the NAWS fund. By that time, the money had already been spent, and the city instead voted to issue a special assessment on city water bills to raise the funds. Minot's economy depends on the Air Force Base located 13 miles (21 km) north of town making the city's economy more robust than other cities of its size due to its large service area; however, it is beset by significant problems with enterprise capital and wage standards. About 30% of Minot residents work two or more jobs, and two-thirds of households earn less than the national median household income. ING/ReliaStar established a service center in Minot in December 1998. Minot has seen a huge increase in population and infrastructure investments in the last several years with the expanding drilling (using the 'frac' petroleum extraction technique) of oil in the Bakken Formation and Three Forks Groups. The State of North Dakota has a website detailing daily oil activity. The Minot Public Schools system operates ten elementary schools (K-5) within the city: Bel Air, Edison, Lewis and Clark, Lincoln, Longfellow, McKinley, Roosevelt, Perkett, Sunnyside, and Washington. The district also operates Bell Elementary, located about five miles southeast of Minot. Jefferson Elementary was closed in 2003. The old Washington Elementary building was closed at the end of 2007 and the students moved to a new building which was renovated from an old health care center. There are also two elementary schools (K-6) on the Minot Air Force Base: Dakota and North Plains. There are three middle schools in the system: the two in Minot are grades 6-8: Jim Hill in the south, and Erik Ramstad in the north. Memorial Middle School on Minot AFB, is named for fallen veterans of the U.S. armed forces. The school was built in the mid-1960s on the northern perimeter of the base. All three middle schools were formerly called "junior high" schools. The city has one public high school, Minot High School, divided between two campuses. A few blocks east of Downtown Minot is Central Campus (grades 9-10), which occupies the original high school building. On the southwest side of the city is the newer Magic City Campus (grades 11-12), constructed in 1973 just west of Jim Hill Middle School. MPS also operates an adult learning center and Souris River Campus, an alternative high school. Private schools in Minot include Bishop Ryan Catholic School, which offers preschool through grade 12 at a single campus. There is also a Protestant K-12 school, Our Redeemer's Christian School. Minot is also home to Minot State University, the third largest university in the state. MSU's campus is at the base of North Hill, just west of Broadway. Originally a two-year teacher's college when opened in 1913, Minot State became a university in 1987. Most of the larger daycare centers and pre-schools in the Minot area work in collaboration with local church groups. There are also programs such as Head Start and preschool programs through Minot Public Schools. The in-home daycare providers are state registered and licensed. Minot's arts community includes an art museum, a symphony orchestra, an opera company, a city band, several dance and theater troupes, a youth/punk concert organization, and the AMP; over 40 organizations claim membership in the Minot Area Council on the Arts. Nearly 40% of the city's residents are of Scandinavian ancestry, and every October since 1977, Minot has been the host to the Norsk Høstfest, North America's largest Scandinavian-American festival. Scandinavian Heritage Park is located in Minot. Scandinavian Heritage Park features remembrances and replicas from each of the Scandinavian countries: Sweden, Norway, Denmark, Finland, and Iceland. Minot is also home to the National Passed Gas Museum. The Minot Park District operates seventeen parks with various facilities; Corbett Field, home to American Legion, high school and college baseball; Optimist soccer complex; MAYSA ice arena; the Sertoma Complex which has 8 softball fields; Souris Valley Golf Course, and an indoor tennis complex. The city's largest parks are Roosevelt Park and Oak Park. Roosevelt Park Zoo is one of the top zoos in the region. Dogs are allowed in Roosevelt Park, a sign is posted at the entrance confirming this. A "bark park" for dogs opened in the summer of 2005. The North Dakota State Fair is held in July annually, in Minot. Nearly all recreation areas however are closed during the long winters. The local high school hockey teams use the ice rink located in the Fair Grounds. The ice rink is also turned into the location of the rodeo. Apple Grove Golf Course, and Souris Valley Golf Course are located in Minot. The Minot Mallards, were a Mandak League baseball team that played their games at Corbett Field. The Minot Minotauros, an NAHL team, play their games at Maysa Arena. The Minot Muskies, played one season with the American West Hockey League and played their games at All Seasons Arena. The Minot Americans were an SJHL hockey club from 1987 to 1994, playing their games primarily at All Seasons Arena. The Minot Top Guns were an SJHL hockey club from 1994 to 1997, playing their games primarily at All Seasons Arena. Other semi-professional hockey clubs calling Minot home were the Minot Raiders/Rangers ('75-'77) and the Minot Maple Leafs ('85-'86). The Minot Skyrockets, a former Continental Basketball Association team, played their games at Minot Municipal Auditorium. The Minot State Beavers play ice hockey at All Seasons Arena, baseball at Corbett Field, football at Herb Parker Stadium and basketball at the MSU Dome. The Mouse River Rollers play roller derby at different locations around the city, including the Maysa Arena. Minot is home to several municipal sports venues including the All Seasons Arena, Corbett Field, Maysa Arena and the Minot Municipal Auditorium. Minot maintains a sister city relationship with the Norwegian city of Skien. Minot is also a sister city of Moose Jaw, Saskatchewan, about 300 miles (480 km) to the north-west. The cities share many qualities, including their size, location on river valleys, historical origins, and air force bases. Minot has several media outlets. KMOT-TV, KXMC-TV and the Minot Daily News report on local news daily. KCJB-AM, KHRT-AM, and Prairie Public have some local news content, but no active journalists. Minot is served by fifteen radio stations (12 FM, 3 AM). Bottineau-based Programmer's Broadcasting owns KTZU and KWGO, along with KBTO of Bottineau. Prairie Public Radio operates KMPR FM 88.9, a local community broadcaster based in Burlington operates a low-power FM station, and the remainder are nonprofit Christian stations, of which only KHRT is based locally. iHeartMedia owns and operates all of the commercial stations licensed to Minot itself: KCJB 910 (Classic Country & Talk), KRRZ 1390 (Classic Hits/Talk), KYYX 97.1 (Country), KIZZ 93.7 (Top 40), KMXA-FM 99.9 (AC), and KZPR 105.3 (Active Rock). This concentration of broadcasting in the hands of one owner has led to criticism. Midcontinent Communications provides cable service to the city of Minot and Minot Air Force Base. Souris River Telecommunications provides cable service to other nearby communities. The principal local newspaper is the Minot Daily News, which publishes seven days a week. The Minot Air Force Base also has a weekly newspaper printed, The Northern Sentry. It is a free publication published on Fridays by BHG, Inc. out of Garrison, ND available on the MAFB, as well as the surrounding communities and many locations within Minot. The Minot State University student newspaper Red & Green is published once a week (Thursdays) during the regular school year, but not during the summer months. Morgan Printing produces the Lunch Letter three days a week on a double-sided leaflet. There is one weekly classified-ad publication, the Trading Post, printed by the Minot Daily News. The Bismarck Tribune is available at several outlets in the city, as is The Forum, to a lesser extent. The railroads that built Minot remain, though Great Northern is now part of the BNSF Railway and the Soo Line is run by the Canadian Pacific Railway. Passenger rail transportation is provided daily on Amtrak's Empire Builder line, connecting Chicago with Portland and Seattle, which stops at the Minot Amtrak station. Trains make a 20-minute refueling and crew change stop in Minot; Westbound trains arrive about 9:00 am local time. Eastbound trains arrive about 9:00 pm. Three major U.S. highways run through the city, connecting it to Canada, Montana, and two interstates: US 2, US 52, and US 83. US 2 runs east-west and is a four-lane divided highway from Minot east to Grand Forks and beyond as well as west to Williston and into Montana. Minot is midpoint along the North Dakota segment of US 2. US 83 runs north-south through central Minot as Broadway. It is a four-lane divided highway from Minot south to Bismarck and north to Minot Air Force Base. Just north of the main gate at the base, the road reduces to two lanes and crosses the Canada–US border at Westhope, ND, where it becomes Manitoba Highway 83. US 52 is a two-lane highway that runs southeast-northwest. Southeast from Minot, it follows a slightly circuitous route to Jamestown. US 52 then merges with Interstate 94 (I-94) after Jamestown, heading due east to Fargo. Northwest from Minot, US 52 crosses the Canada–US border at Portal, ND/North Portal, SK, where it becomes Saskatchewan Highway 39. The Minot Bypass follows alternate alignments of these roads around the city in its northwest and northeast quadrants, with southwest and southeast bypasses in preliminary planning stages. Minot International Airport is served by four airlines as well as charters and air taxi service around North Dakota. Delta Air Lines offers up to six daily round trips to Minneapolis International Airport, offering hundreds of daily connections. United Airlines offers four daily round trips to its Denver International Airport hub. Allegiant Air provides up to four weekly round trips to Las Vegas McCarran International Airport and up to five weekly round trips to Phoenix-Mesa Gateway Airport. Automobiles dominate intracity and local area transport. There is limited fixed-route city transit service (Minot City Transit) on weekdays, and flexible-route rural transit service (Souris Basin Transportation) on an occasional basis. Local transit services for the elderly and disabled (Minot Commission on Aging Transit) meet federal guidelines but have 24-hour advance notice requirements. Pedestrianism in the city is inhibited by several factors; the sidewalk network is poor in many areas of the city, though improving. Automobile drivers take the right of way at all but the best-marked crosswalks, and major points are often separated by relatively large distances and hill slopes. Skateboarding is illegal in streets and on sidewalks (though there is a skating area in Roosevelt Park), and rollerblading is generally disallowed by downtown landowners. Dakota Territory Air Museum is an aircraft museum near the airport. It contains many war and civilian aircraft. Scandinavian Heritage Park is home to the Minot Visitor's Center, as well as buildings based on the Scandinavian style of architecture, including a Stave Church. The grounds are home to the Minot's Arts in the Park series. Old Soo Depot Transportation Museum, museum and research center in the restored 1912 Soo Line Depot. North Dakota State Fair Center, located on the state fairgrounds, is home to many of the city's largest events, including: The North Dakota State Fair, the Norsk Høstfest, the Big One craft show, the KMOT Ag Expo, and the Great Tomato Festival. It also hosts rodeos, and college hockey games. Taube Museum of Art, located in the 1906 Union National Bank Building, features exhibit space in the Main Gallery and the Lower Gallery, which change every four to six weeks. The following is a list of notable people who were either born in, are current residents of, or have lived in Minot. Kevin Miller, video game voice actor. ^ a b "Population and Housing Unit Estimates". Retrieved October 3, 2018. ^ Micropolitan statistical areas and components Archived 2007-06-29 at the Wayback Machine, Office of Management and Budget, 2007-05-11. Accessed 2008-07-27. ^ Schramm, Jill. "Census Changes: Minot Area Growth Slows After Flood". Minot Daily News. March 14, 2013. ^ a b Jackson, William (2008). Almanac of North Dakota mysteries & oddities, 2009-2010. Valley Star Books. p. 34. ISBN 9780967734989. OCLC 259419005. ^ Klinenberg, Eric. Fighting for Air: The Battle to Control America's Media. Holt: New York, 2008. ^ Fundingsland, Kim (June 21, 2011). "'It's a sad day' — Crest could be 10 feet higher than June 1". Minot Daily News. Archived from the original on June 24, 2011. Retrieved April 6, 2012. ^ "Updated Köppen-Geiger climate map of the world". people.eng.unimelb.edu.au. Retrieved 2018-12-21. ^ National Climatic Data Center, Monthly Station Normals (1971–2000) for North Dakota,  Archived 2014-08-14 at the Wayback Machine. Retrieved 20 November 2006. ^ The station is located at 48°10′49″N 101°17′47″W﻿ / ﻿48.1803°N 101.2964°W﻿ / 48.1803; -101.2964. ^ a b "NowData - NOAA Online Weather Data". National Oceanic and Atmospheric Administration. Retrieved 2013-06-28. ^ "Station Name: ND MINOT EXP STN". National Oceanic and Atmospheric Administration. Retrieved 2014-03-23. ^ "U.S. Decennial Census". Census.gov. Archived from the original on May 12, 2015. Retrieved May 26, 2013. ^ "City of Minot 2013 Comprehensive Annual Financial Report" (PDF). June 16, 2014. p. 147. Archived from the original (PDF) on July 13, 2014. Retrieved June 16, 2014. ^ "Minot Area Development Corporation". Retrieved April 7, 2012. ^ Oakes, Larry (October 24, 2011). "North Dakota: where the jobs are". The Seattle Times. Archived from the original on October 27, 2011. ^ Jennifer B. Lee, "On Minot, N.D., Radio, A Single Corporate Voice, The New York Times, Mar. 31, 2003. ^ Peter DiCola, "The Debate Over Minot Radio", The Huffington Post, Jan. 11, 2007, updated May 25, 2011. 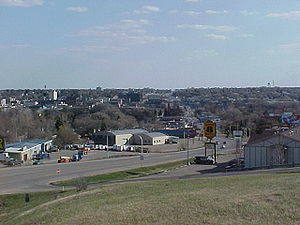 Wikimedia Commons has media related to Minot, North Dakota.